Welcome to the Practice of Kristi Alexander, DDS. Dr. Kristi Alexander has always embraced utilizing new technology to improve the quality of care we provide to patients, which is why laser dentistry is such an important part of our practice. 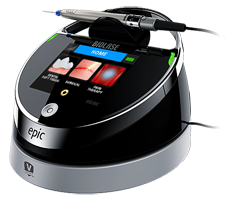 Today, dental lasers have a wider variety of applications than ever before. By adjusting the frequency, pulse, and focus of the lasers, they can be calibrated to have the gentler touch needed to treat soft tissue infections (gum disease), or be strong enough to remove damage or decay from the teeth themselves—no drilling or anesthetic required! Furthermore, this pain-free approach is not the only benefit provided to patients. Studies have shown that lasers sterilize teeth and gum surfaces as they work, so there is a reduced risk of future infection. And, since no surgical cutting or sutures are required, patients experience quicker healing times compared to traditional treatments. So, if someone were to tell you there is a treatment that is less invasive, pain free, better at treating your problem, and that would reduce your healing times, you’d probably think it’s too good to be true. But it’s all a reality now, thanks to advancements in laser technology. We’re located in Fair Oaks, CA and we deliver the finest in dental care available today, including the latest cosmetic dental procedures and dental implant restorations. We place bonded tooth-colored fillings and help patients with teeth whitening to achieve their brightest smiles. Our experienced and friendly team takes great pride in keeping your smile beautiful.